Peter Lynch Growth is a growth investing strategy inspired by the approach of former Fidelity fund manager Peter Lynch, who wrote One Up on Wall Street. It looks for consistently profitable, relatively unknown, low-debt, reasonably priced stocks with high, but not excessive, growth. Among the criteria used, the strategy looks for stocks with a low price to earnings growth rate (PEG). 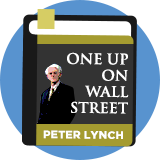 Peter Lynch wrote: "If you stay half-alert, you can pick the spectacular performers right from your place of business or out of the neighborhood shopping mall, and long before Wall Street discovers them." Lynch managed Fidelity's Magellan Fund between 1977 and 1990 and during the time racked up average annualised gains of close to 30%. He urged investors to adopt a bottom-up investing process and "buy what you know". Peter Lynch was arguably the most successful mutual fund investor ever. During the thirteen years that Lynch managed the Fidelity Magellan Fund (1977-1990), he racked up average annualized gains of close to +30%; nearly double the S&P 500’s +17.5% annualized performance over the same time period. At the time of Lynch’s retirement in 1990, the Magellan Fund was the largest mutual fund in the world (subsequently passed by Vanguard’s S&P 500 Index Fund. ).